The MLB trade deadline isn’t for another six weeks. That doesn’t mean that it won’t make waves in fantasy baseball sooner than that. There are a couple players in particular that are very likely to move. With these players, it makes sense for both teams to make the trade sooner rather than later in order to get the most value, whether it be in prospects or production. The Padres are nine games out and at the bottom of the National League West division. Their closer, Heath Bell, is a one of the elite bullpen arms in baseball. He’s also a free agent at the end of the year and is already the highest-paid player on a cash-strapped team. Former GM Jim Bowden recently said that Bell is the player most likely to be traded, and with good reason it seems. Behind Bell are a couple arms worth owning if he’s going to leave town. Most likely, Mike Adams is next in line. The righty is working on his fourth straight year with more than a strikeout per inning. He also has great control. That mix has produced a 1.71 ERA over that time span — he’s really good. There is one caveat with the 32-year-old, however: he’s only under team control for one more year. Luke Gregerson, on the other hand, is under control for three more years and is also excellent. He’s managed a strikeout per inning over the first three years of his career, and even if his ERA isn’t as pristine as Adams’ (3.14), he gets good ground balls (48.1% career) and has one of the best sliders in the game. If only he was healthy — a strained oblique has felled him at the wrong moment. Then again, Gregerson uses his slider almost twice as much as his fastball, and some of my recent research has shown that heavy slider usage can lead to injury. Adams is the safer pick overall. In New York, the Mets are eight games back. Even if they only have two teams in front of them, one of them has an historic rotation and the other is stacked with young talent. Add in some much-publicized monetary issues, and it just doesn’t seem like the Mets need Francisco Rodriguez to stick around. The sticking point is a $17.5 million vesting option for next year, and a limited no-trade that allows him to block a trade to ten mystery teams. But if the Mets can find a team that’s not on the list and has an established closer (in order to keep his option from vesting), there’s an immediate match, and the team is highly motivated to make such a deal. Behind Rodriguez, there isn’t an easy solution. Well, there is, but it isn’t very forward-looking. 38-year-old reclamation project Jason Isringhausen is the obvious set-up man and the team leader in holds. Some fans have hopes for Bobby Parnell as the closer of the future, but the flame-thrower has terrible control. 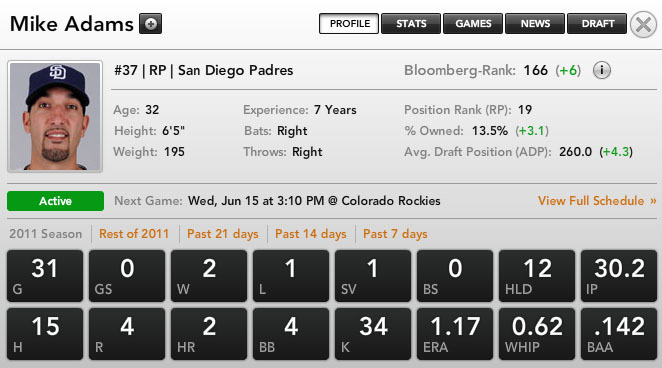 No other reliever has stepped to the fore, although hometown hero Pedro Beato has an interesting pitching mix. He still doesn’t have the strikeout punch of a closer right now, though. Even with Isringhausen’s mediocre strikeout and walk rates, and advanced age, he’s probably the dude once K-Rod leaves town. The trade deadline comes July 31st. By thinking ahead, you might just own two newly minted closers by then.